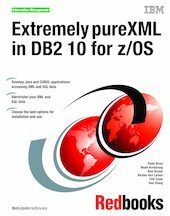 The DB2® pureXML® feature offers sophisticated capabilities to store, process and manage XML data in its native hierarchical format. By integrating XML data intact into a relational database structure, users can take full advantage of DB2's relational data management features. In this IBM® Redbooks® publication, we document the steps for the implementation of a simple but meaningful XML application scenario. We have chosen to provide samples in COBOL and Java™ language. The purpose is to provide an easy path to follow to integrate the XML data type for the traditional DB2 for z/OS® user. We also add considerations for the data administrator and suggest best practices for ease of use and better performance.